At the physical level, the network is almost completely implemented with dark fibre, connecting the network’s Points of Presence with each other and to the numerous user sites (∼ 1000). Only in those cases where fibre links are not available and bandwidth requirements are low, alternative technologies may be used to connect peripheral sites. GARR is committed to reducing the digital divide and bringing high performance connectivity to all regions, to support its users’ research activities regardless to their geographical location. To this end, we constantly engage in collaboration and fundraising activities. On top of the physical level, the network has two layers, for transmission and IP/MPLS. Optical networks are based on optical fibres, transmission nodes (where light signals are generated, multiplexed and transmitted) and amplifiers, located along the fibres to regenerate the signals and enable them to reach their destination. On a homogeneous optical network, the hardware platform with its nodes and amplifiers is supplied by the same technology provider. 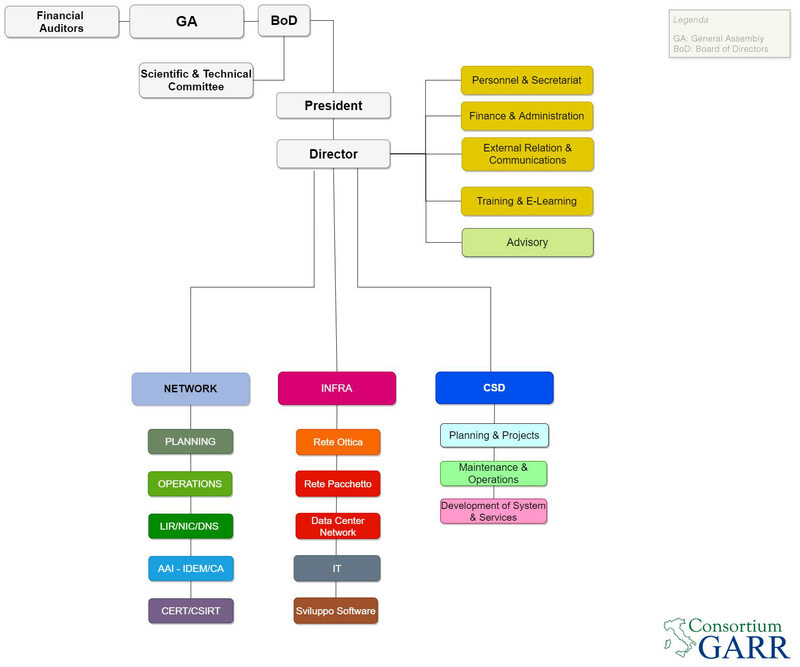 The GARR network, however, is currently based on the technology of two different providers. The Huawei solution is operational in central and northern Italy since 2011, while the other, implemented in the GARR-X Progress framework, is based on the Infinera platform and is operational since 2005. This newer technology uses coherent signal transmission, capable of multiplexing a capacity up to 8Tbps and client services at 10, 40 and 100 Gbps over a simple fibre pair by exploiting a 500 Gbps super-channel. The network is currently undergoing a reshaping that will extend the most advanced features of GARR-X Progress to the whole Country by the end of 2017. It is a long term investment that will allow GARR to flexibly extend bandwidth capacity in the future, given its full control of dark fibres and of the equipment needed to light them, in complete independence from telecommunications operators. Thanks to this action the backbone transmission capacity will reach 1 Tbps at the core nodes in Rome, Bologna and Milan, while the IP/MPLS routers will be strengthened with 100Gbs links between these PoPs; meanwhile, in 2017 GARR will implement new fibre optics links for about 120 sites, of which 50% will interconnect to GARR for the first time. GARR has chosen to safeguard the investment made in GARR-X for as long as possible, by maintaining in operation the transmission equipment and using the “alien wavelengths ” technique to transport the 500 Gbps Infinera superchannels between main PoPs in central and northern Italy, as a response to the growth of traffic in these regions. As demonstrated in the field trials carried out in 2015/2016, it is possible to transport the Infinera superchannel on the Huawei network by sharing the optical spectrum (i.e. the fibre transports both Huawei and Infinera channels). The evolution of the network in 2017 will hence follow a conservative approach, with the Huawei nodes and amplification chain continuing to provide 10 Gbps client services. Through the transmission nodes in Milan (Lancetti and Caldera), it will be possible to extend Infinera’s optical/electrical domain to other regions in Europe, thus implementing the alien wavelengths model at the European level. Financial sustainability for the Research and Education community has been guiding GARR’s evolution strategies throughout its history. In this case as well, the objective is to offer high performance and scalability over time, while ensuring cost-effectiveness in operational expenditures and an adequate level of investments in infrastructure via GARR’s ordinary funding sources. The IP/MPLS network is based on a high-capacity backbone implemented with circuits that exploit GARR’s DWDM infrastructure. These circuits, with a capacity of 100Gbps between larger backbone PoPs and of multiples of 10 Gbps between the aggregation PoPs, terminate on backbone routers; these are high throughput equipment where several services terminate directly, including international Content Delivery services (i.e. Google Cache, Akamai Cache), GARR’s mirror and filesender, as well as links to some user sites that have especially demanding access requirements (i.e. 100 Gbps or multiples of 10 Gbps), like large scientific data centres, research laboratories and radiotelescopes. Aggregation routers connect to core routers with 40 or 10 Gbps links. The overall capacity between two backbone PoPs is at least 60 Gbps, with 100 on more recently implemented links, in particular those included in the GARR-X Progress project, and 120 Gbps between Bologna and Milan. To prevent and minimise possible faults, the network is designed to be redundant: as a rule, each router in a given PoP is interconnected to two different backbone PoPs.